Sometime in 1983, 84’ maybe, in a darkened musty theater that smelled of stale pop corn and spearmint gum, I saw the movie Cujo, a cinematic tale of a rabid, gigantic dog that terrorized a family trapped in a car. Only two things stand out in my memory of that event long ago: my first R-rated movie wasn’t all it was cracked up to be (Did all that blood really look like strawberry jam? ), and sometime before the end I became monstrously ill in the barely lit girls bathroom located in the bowels of that old theater. I ask myself now, was I sickened by the lack of Oscar-worthy performances, excluding the dog - he was an excellent actor, or was it just bad luck to catch an untimely flu when undoubtedly boys must’ve been present? I can’t remember much about the story so the latter must’ve been the case. Stephen King can’t remember it either, not the story itself, but writing it. A whole novel writing process, forgotten, obliterated in a drug-induced haze. Amazing. That’s just one of the little tid-bits King reveals in his memoir, a book I thought because of its title would be about writing, but is really a peek into the mind of a great story teller. And, did I mention, I don’t remember reading one of his thirty-plus books. So, why did I read this one? Good question. I guess he's always been such an opinionated old fart that I wanted to learn more about him, and even though I’ve never been much interested in any of his novels, there is no doubt this man’s imagination is off the charts. I’ve always thought him a down-to-earth sort of writer, not afraid to get his hands dirty. I can almost tell that just by looking at his picture. He looks like a man who has never had an easy time of it, his face weathered and beaten by the gale force wind of life. Even with his monumental success, there’s nothing snooty about him. A straight shooter, if you will. For the good, and bad. 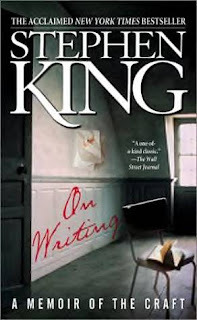 Two parts auto-biography, one part writing advice, On Writing is an honest look into who Stephen King is, as if he were conversing with you from an easy chair in his study; his voice raspy and deep from years of smoking; his eyes a bit dimmer from that accident that almost claimed his life while he finished this book. He rambles like a cantankerous old man whose life experience he believes begs him worthy to offer advice, whether you want to hear it or not. This memoir, like that type of conservation is really just a collection of random informal thoughts collected on paper, sometimes in chronological order, sometimes not. I really enjoyed the nuggets of writing advice he offered in this book. I still have it on the shelf and will refer to it once in a while when I'm looking for that informal tone. I didn't mind it even though he did ramble on at times. I thought the title didn't fit. The book is more about him than writing in general. He's always been one weird duck. Now I know why. One thing I did like was learning how he came up with some of his ideas. I've always wondered how he thought up with so many stories. What an imagination he has. I liked this book - I agree with you Lula that it was an interesting window into the mind of a crazy prolific writer. I read almost all of his earlier books voraciously when I was a teenager. This was a fascinating look into where those stories came from. Great review too! Thanks Trixie! Reading this definitely made me want to revisit a book or two of his, especially the ones he referred to in the book. I wonder if Cujo is on NetFlix...ah, memories. Very interesting. I have always wanted to pick this up since I have always been a fan of about half his work. He is just so hit or miss with me. Hey, congrats Trixie! I've heard good things about that Dark Tower series. You will need something to keep you awake during the long night stretches. Maybe I should start there too. Too many to choose from and you're right P&P, a lot of people feel like you do - some are good, some stink.